^ "Regional gross disposable household income, UK - Office for National Statistics". www.ons.gov.uk. Retrieved 2019-03-19. ^ "The Glades, Bromley". Lunson Mitchenall. Retrieved 2019-03-19. 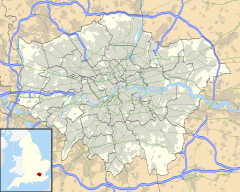 ^ "Bromley | borough, London, United Kingdom". Encyclopedia Britannica. Retrieved 2019-03-19. ^ Admin, Bromley. "Bromley Charter Market". www.bromley.gov.uk. Retrieved 2019-03-19.